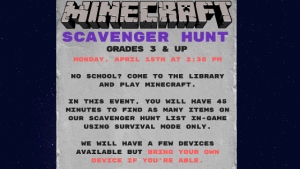 In this event, you will have 45 minutes to find as many items on our scavenger hunt list in-game using survival mode only. We will have a few devices available but bring your own device if you’re able. Grades 3 & up. Come make slime! Registration required, registration opens 3/20. REGISTER HERE. No school? Come make a unique piece of art with Miss Alex. Grades 3 & up. Registration required. Registration opens March 20th. REGISTER HERE. Learn about a new famous person every month on the third Thursday! We will be using the popular Who Was Series. 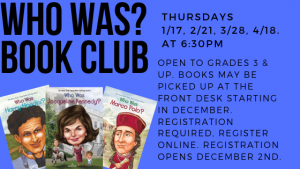 Open to grades 3 & up. Books may be picked up at the front desk starting in December. Registration required, register online. REGISTER HERE. 4/18: Who was Milton Hershey?